A few of us gather from 9.30am on a Sunday morning in the small office by the front doors to pray for the service. It would be great if you could join us – drop in when you arrive for as long as you can. As we continue to develop our small groups another new group will be starting in May in Swinton. This will be a study group that offers series teaching and will run for a number of weeks. Spaces will be limited to 8 to if this is something that you would find helpful look out for the details and sign up as soon as you can. On Wednesday 14th March we will begin a new course called Life Explored. Life Explored is a a 7 week course which is for people who are new to the Christian faith or interested and want to understand a bit more. Come and explore questions about life and where God fits into it all. If you are interested or know someone who may benefit from those kind of conversations please sign up here or let Natalie know. There are resources, that accompany the course so the names and numbers of those who are willing to commit to the course is really important. In case you missed the presentation Natalie did on Street Pastors, here’s a little snapshot. Over 100,000 people visit Manchester City Centre every weekend. Many come for enjoyment and entertainment and have a great time, there are others who find themselves in vulnerable situations which can become dangerous. Street pastors are Christian volunteers from different churches who have a concern for their city and community and want to reach out in a practical and visible way. Our expression of God’s love is through caring, listening and helping. We patrol the streets on Friday night between the hours of 10 and 3am. Matthew 5:16 says ‘Let your light so shine before men that they may see your good works and glorify your father in Heaven’. People who would be willing to be trained up and commit to patrolling one night per month. Maybe you have some time or skills to offer. People can give a set amount per month (no amount is too small) or make a one off donation. Or you may want to fund some flip flops, lollipops, bottles of water or space blankets which we give out for free. Do you have digital skills that would help with our online presence? Think about it, pray about it, let Natalie know if you would like to help in some way. There will Prayer Meeting in the council chambers at Salford Civic Centre on Wednesday 25th April at 7:30pm. This is an open event organised by Salford Church Partnership. The prayer meeting will be in the presence of this year’s Ceremonial Mayor and Mayoress, Councillor Peter Connor and his wife Mary. The Mayor will be presented with a bible as a gift from the churches of Salford and a momento of his year in office. The city Mayor Paul Dennett, will also be there and will be interviewed. There will be prayer for all sorts of issues around the council and the city which will hopefully be an encouraging and significant evening for the city. It would be great if the council chambers were packed with Christians from churches all over Salford. What a witness and sign of our unity that would be the church blessing those in authority and the city. 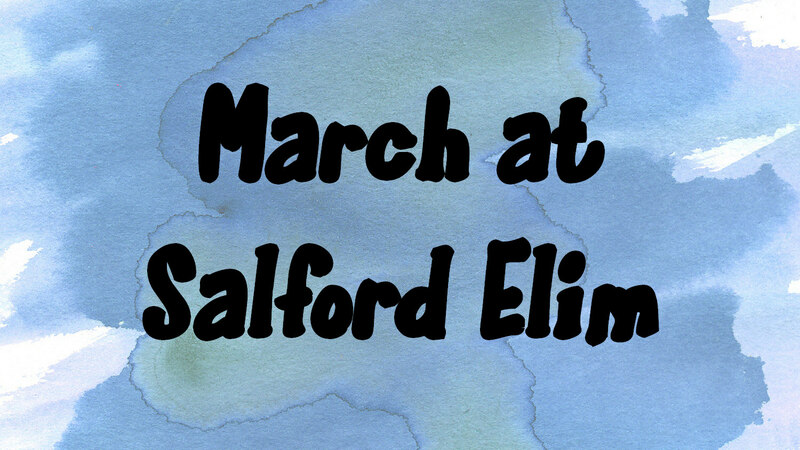 It’s an opportunity to be present, to pray and to play our part in the bigger picture of God’s church and city of Salford. Spread the word and come if you can. Voices o’ th’ Vine will be singing in The Vine Cafe from 8-9.30pm on Thursday the 8th and Thursday the 22nd of March. If you enjoy singing then come and join us. It’s really informal and fun and there’s always room for new people, no matter how much experience you have.